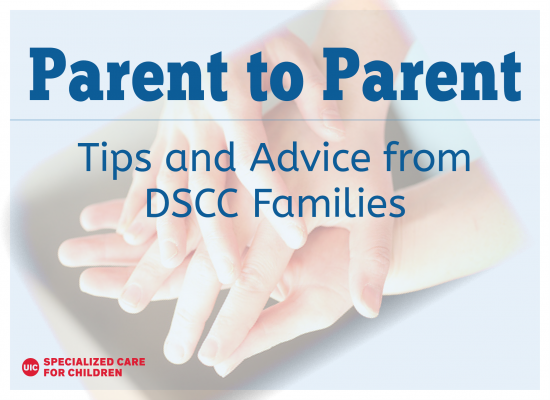 DSCC’s dedicated and experienced parents share advice in honor of National Family Caregivers Month. National Family Caregivers Month in November recognizes the real-life heroes who selflessly care for their loved ones and relatives. The theme for this year’s campaign is “Caregiving Around the Clock.” We at UIC’s Division of Specialized Care for Children (DSCC) know that caring for children with special needs is truly a 24-7 job with an emotional and physical toll like no other. In honor of National Family Caregivers Month, we asked members of our Family Advisory Council to share their advice to help other parents and caregivers manage the stress and make sure their own emotional and physical health is not neglected. Read on for some great tips and helpful insights from two of our dedicated and experienced parents, in their own words. Elizabeth Curry is a mother of 12 children, five of whom were adopted: two from Vietnam and three from China. Build a support system. You need other people in your life who understand your challenges and are there for you. I know this is often not an easy task, as parenting a child with special needs can be extremely isolating. Ideally, your support system includes other special needs parents, as they ‘get it’, as well as others who support you even if they don’t have first-hand experience. It is important to have a friend whom you can call and burst into tears at. It is important to have people who can be yours and your child’s cheerleader. It is just important to have other people in your life. Building such a support system can take time and effort. I am particularly aware of this since we recently moved from a place we have lived for over 25 years to an entirely new area. I left a large support system where I had a lot of social capital, and am now faced with building it all from scratch. Take care of yourself. This means that you do your best to get enough rest, eat foods that are good for you, and get some exercise. In order to help our children, we need to be functioning. All too often, we let our children’s needs take priority while our emotional and physical health suffers. This does not help our children. I find the exercise piece to be particularly challenging, but there was one particularly stressful time in my life where I took up running. I needed both the time alone and the physical activity to give me a small window where I wasn’t dealing with the unpleasant things that were taking up all my time. It gave me just enough breathing room to get through the hard stuff. Do something just for you. I love to make things… sew, knit, spin, cook, etc. I also love to read. If I can carve out a small portion of my day to make something and to read, I am a significantly happier person, and consequently a much better parent as a result. Doing these things reminds me that I am more than just a parent to my children, even as much as I love that particular role. Doing things which bring me joy refreshes and energizes me. 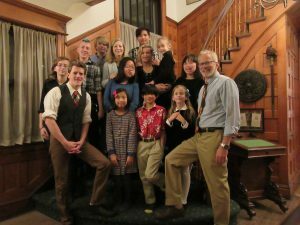 Elizabeth Curry is a mother of 12 children, five of whom were adopted: two from Vietnam and three from China. She hopes that by sharing her family’s experiences she can encourage others in the trenches. When she is not taking care of children, Elizabeth writes, homeschools, sews, teaches piano, and loves reading. She also has her own blog, Ordinary Time. It takes a village to raise a child, especially one with special needs. Reach out to organizations who might help with respite care and gather a network of family or friends who you feel comfortable with to watch your child(ren). Caregivers need time away to de-stress. Remember to treat yourself. Cassie is the mother of two sons – Kayden, 1, and Noah, who is 5 and diagnosed with a fatal neurodegenerative disease simply known as KIF1a disorder. To keep a clear mind, I find it helpful to write down my appointments and tasks on a calendar and dry erase board. It helps me stay on task and prioritize. Organizing thoughts, ideas and assignments will help with the everyday anxiety attached to having a special needs child or any family really. Make sure you are able and fit enough to lift those sweet babies by exercising and eating healthy. It may sound cliche but by choosing an active activity you can do either by yourself or with the family can keep you in shape to better care for others. What I would suggest to a person with a new diagnosis: reach out! There are others out there with the same diagnosis, even if it is rare. Can’t find anything? Start your own support group. 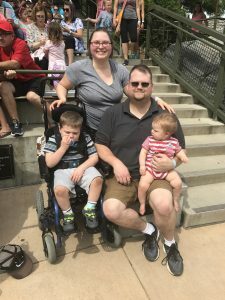 Two years ago, when my son was diagnosed with an extremely rare diagnosis, I created the first Facebook support group in hopes to reach other families. This led to KIF1a.org and a path towards learning more about KIF1a associated neurological disorders. You are not alone. 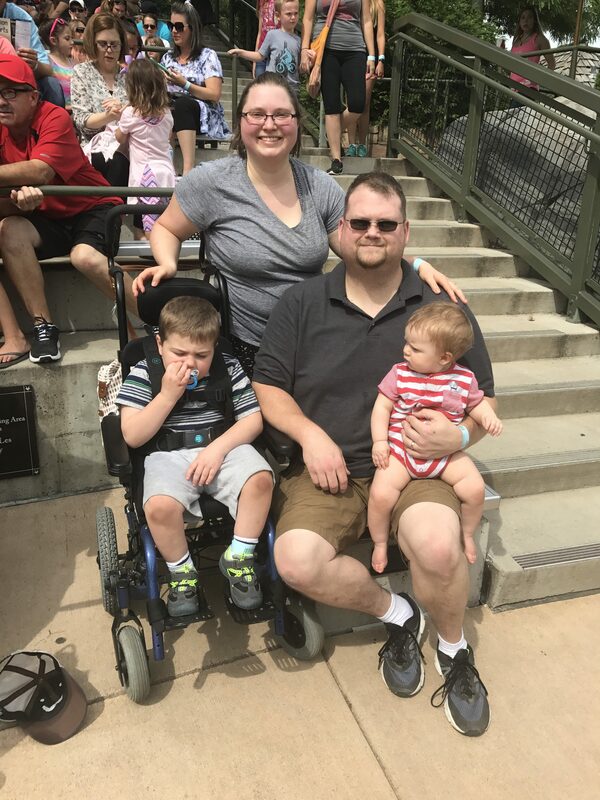 Cassie is the mother of two sons – Kayden, 1, and Noah, who is 5 and diagnosed with a fatal neurodegenerative disease simply known as KIF1a disorder. She is an advocate of the KIF1a organization (http://www.kif1a.org/) and the founder of a KIF1a Facebook support group She has a Bachelor of Arts in Social Work and is working toward her master’s degree in professional counseling.